Dara expected to find natural wonders when she set off for a spring break camping trip. Instead, she discovers a primitive boy— he’s stealthy and handsome and he might be following her. Intrigued, Dara seeks him out and sets a catastrophe in motion. Thrust back into society, Cade struggles with the realization that the life he knew was a lie. But he’s not the only one. Trying to explain life in a normal town leaves Dara questioning it. As the media swarm and the police close in, Dara and Cade risk everything to get closer. But will the truth about Cade’s past tear them apart? So THIS was the summer book for me. I snagged this book back in January or February and I was biding my time until I could dig into it. I finally gave into this book about a month ago and I came out confused. There were moments in this book that I thought were amazing. The chemistry between Dara and Cade was palpable at times, but then, at other times, the book was .... boring. 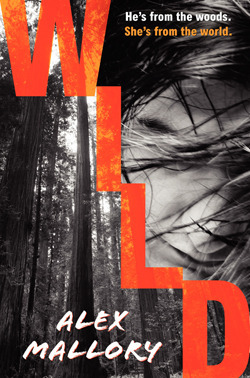 Wild is supposed to be a retelling of Tarzan- a story that I never considered to be boring, and yet somehow... it was. I thought there was too much emphasis on conversations and not enough on actions. I wanted to know more about what it was like for Cade, but it just fell flat for me. I would say the interactions between Dara and Cade were excellent and the rest were meh. So what would I rate this book? I have absolutely no idea.... I loved the romance, but hated how much it lagged at times. I'm not sure what rock I've been living under, but I didn't know this was a Saundra Mitchell book! Do you know offhand why Saundra used a pseudonym, Coranne? Is it New Adult?